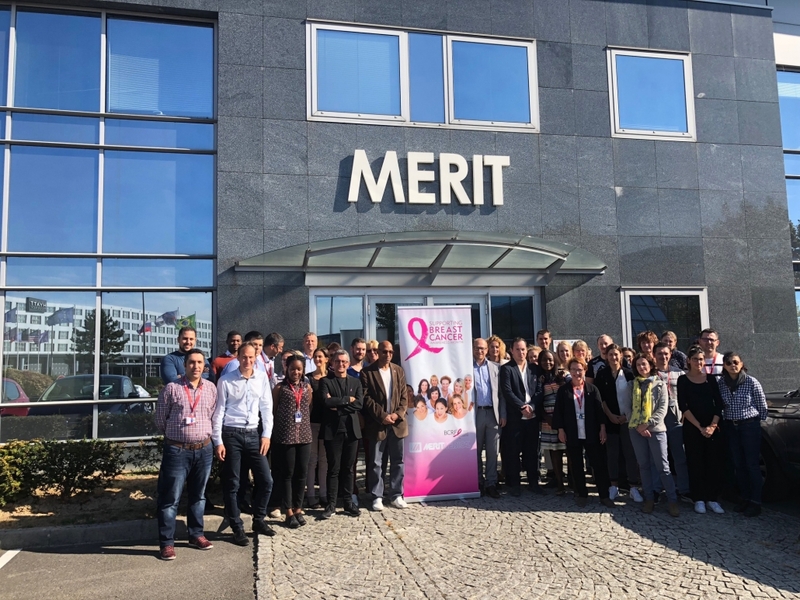 October was Breast Cancer Awareness Month around the globe, and Merit Medical was thrilled to share its support for this cause. Merit has a long history of investing in products and therapies that support women’s health, including the minimally invasive treatment of uterine fibroids and now, the Pink AchieveTM biopsy device intended specifically for breast biopsy. Below you’ll find all the ways that Merit recognized Breast Cancer Awareness throughout October. 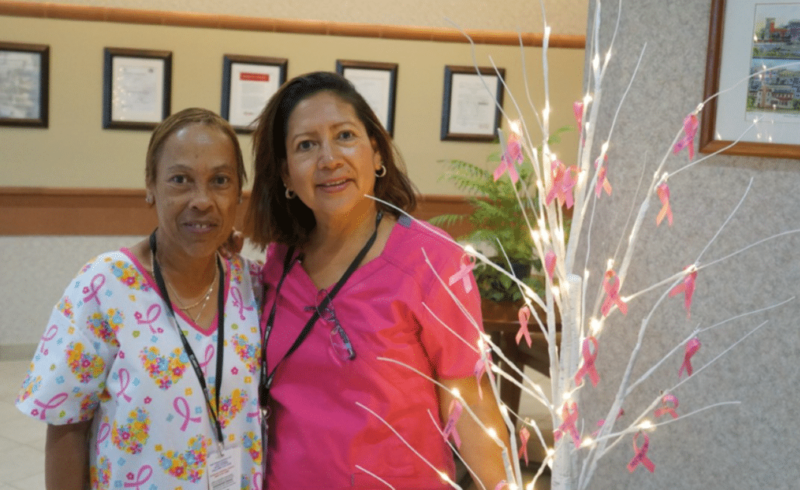 Merit Medical employees throughout the world were united in recognizing breast cancer in October. Enjoy this video looking back at some of the month’s highlights and memories. 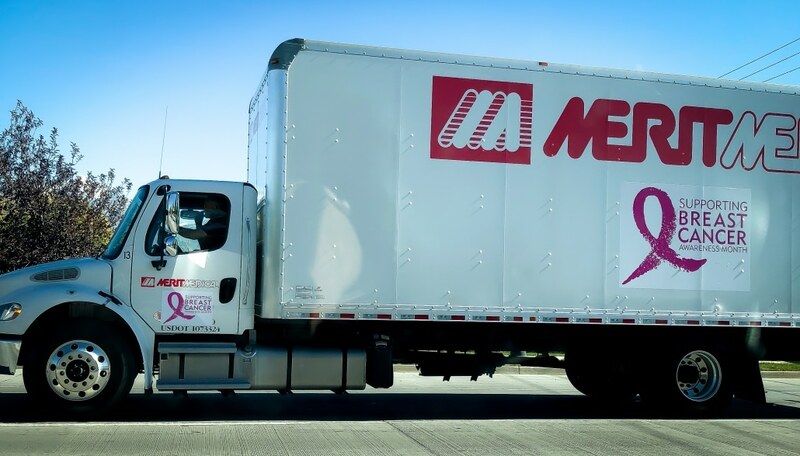 Merit’s delivery trucks display Breast Cancer Awareness decals during the month of October. 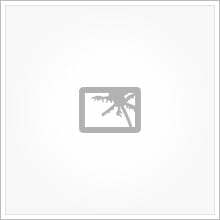 Merit HQ planted a tree as a permanent symbol of Merit’s support of Breast Cancer Awareness. 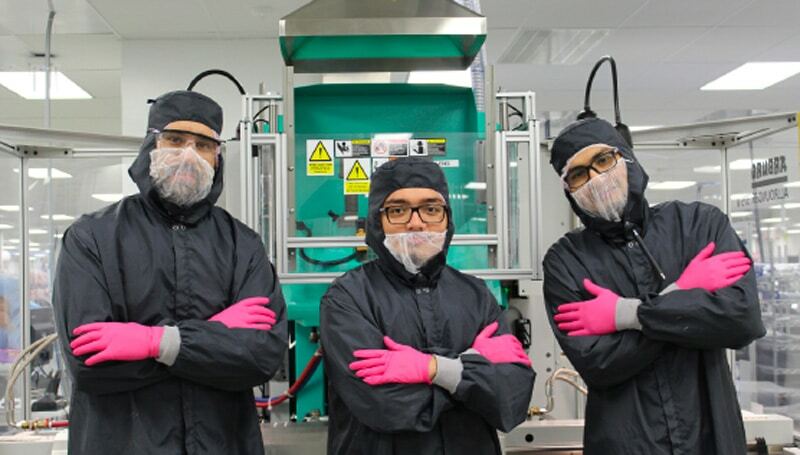 The Tijuana, Mexico, facility gave all employees pink gloves to use during the entire month of October. Merit’s employees from the Roissy, France, facility gathered around their Breast Cancer Awareness Month banner. 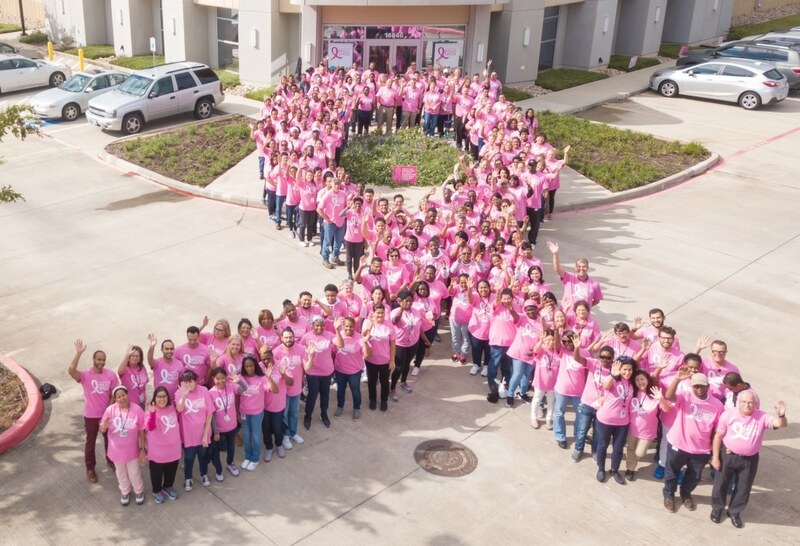 Merit’s employees at the Pearland, Texas, facility came together with matching pink shirts to form a Breast Cancer Awareness ribbon. 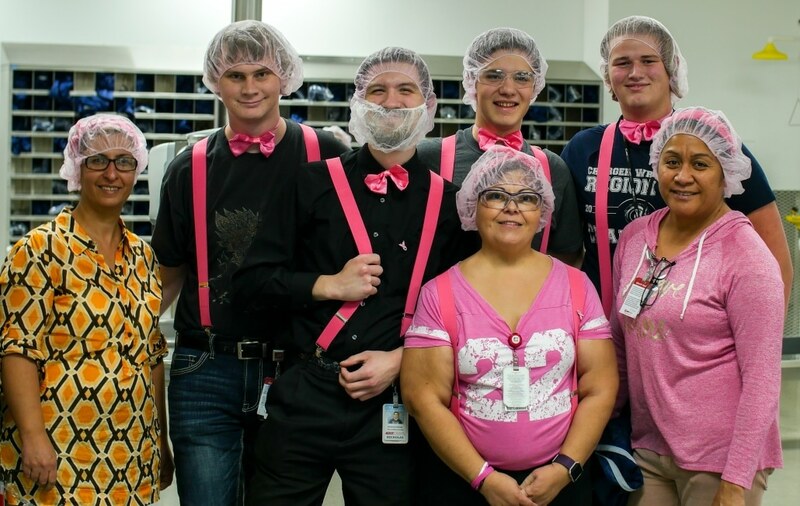 Pink hairnets are provided for all of Merit’s production staff during the month of October. 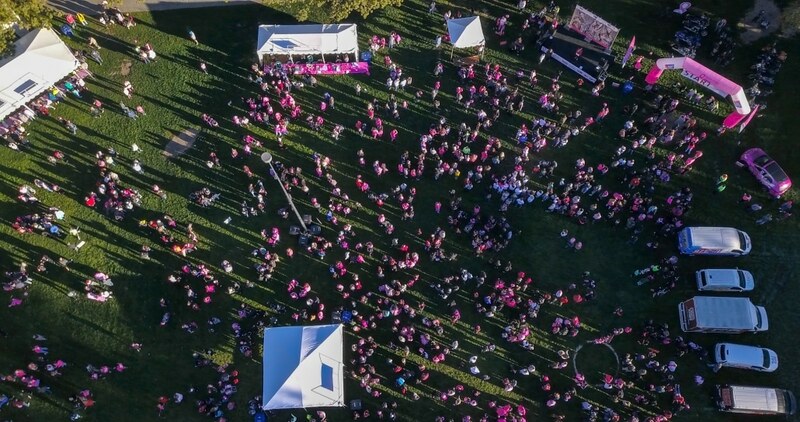 Merit employees enjoyed an awesome day at the Breast Cancer Awareness walk in Salt Lake City, Utah. 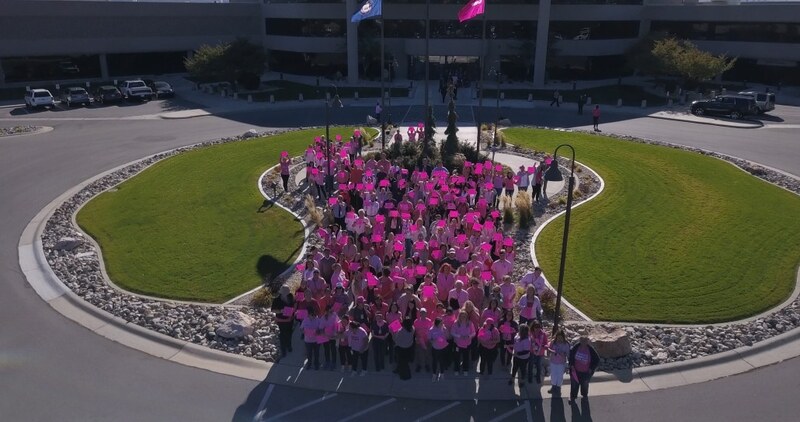 Employees from Merit’s Salt Lake City HQ gathered for a group photo where they held up pink signs with names of people who have had, or are currently battling breast cancer. Recognizing Breast Cancer Awareness Month at Merit’s facility in Galway, Ireland. 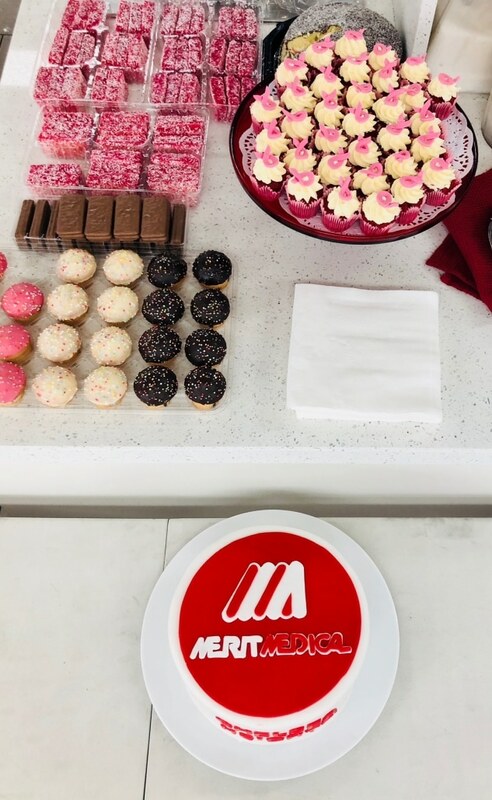 Melbourne, Australia, provided employees with an array of pink breast cancer awareness themed treats to recognize Breast Cancer Awareness Month. 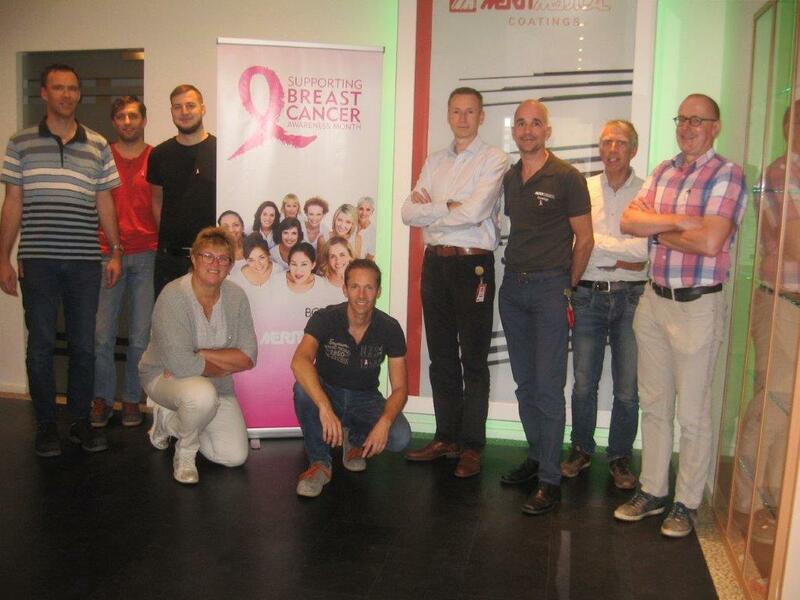 Venlo, Netherlands, exhibiting their Breast Cancer Awareness banner! Merit’s facility in Richmond, VA, is honoring Breast Cancer Awareness Month by hanging pink ribbons on a tree with the names of people who have been affected by breast cancer. 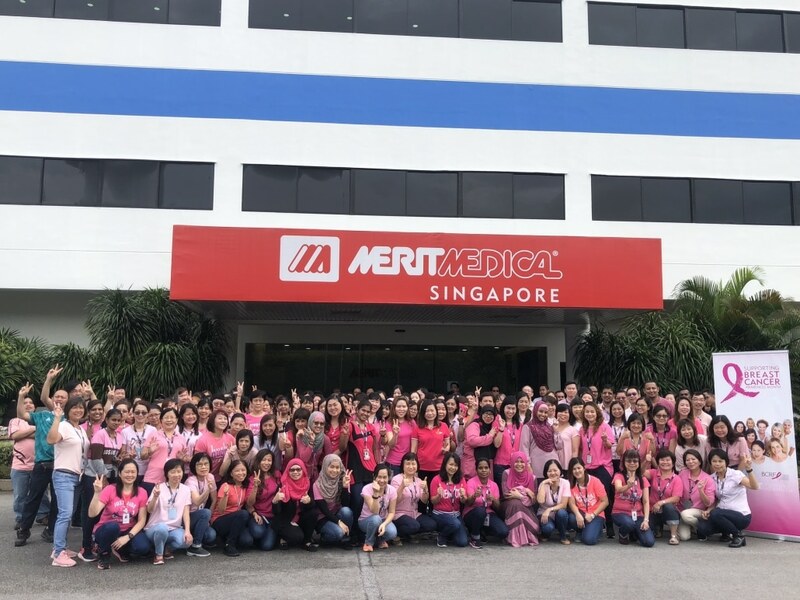 Employees from Merit’s Singapore facility congregated for a group picture showing off their pink in recognition of Breast Cancer Awareness Month. 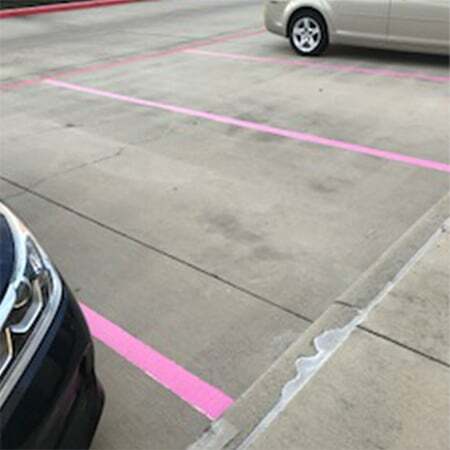 Merit’s Pearland, TX, facility had a Parking Spot Raffle where winners received front row parking in freshly painted pink parking spots for the whole month of October. Proceeds from the raffle went to a local Houston Charity that helps women and men dealing with breast cancer. 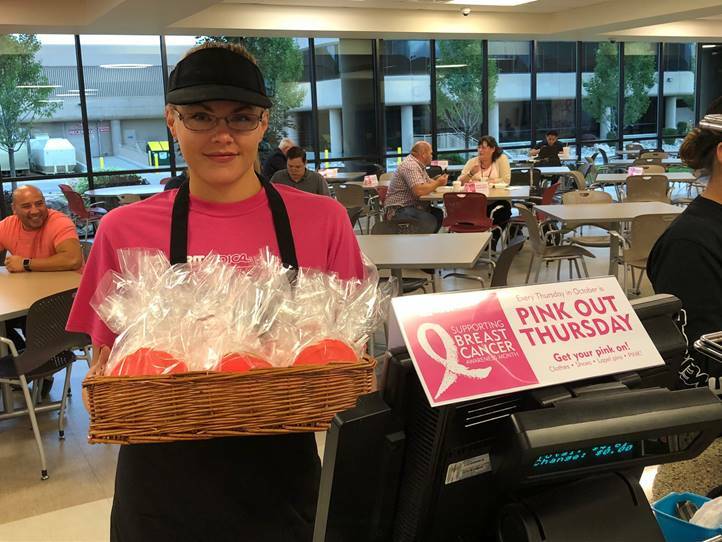 Pink breast cancer awareness cookies are available all October in the Merit cafeteria. 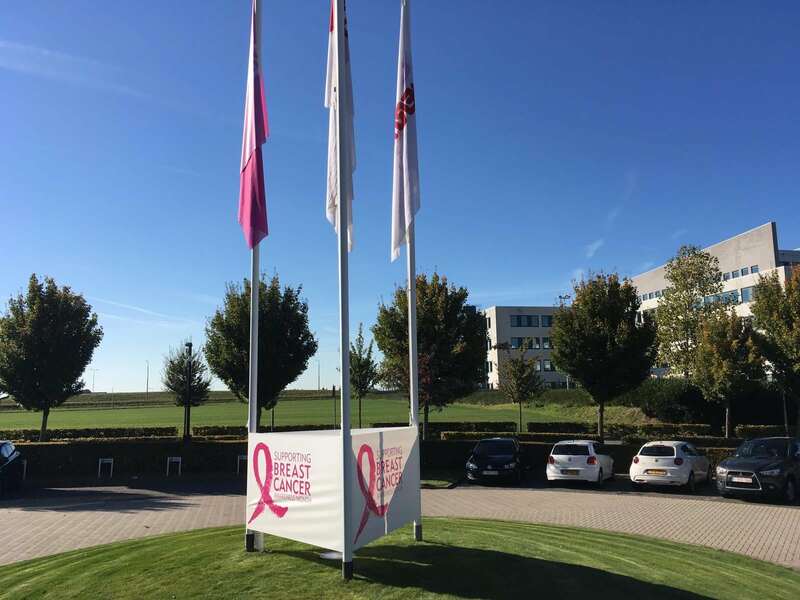 Merit’s EU HQ in Maastricht, Netherlands, displays their pink flag to recognize Breast Cancer Awareness Month. Merit’s Mexico facility shows support by changing the spotlights for the Merit logo from white to pink for Breast Cancer Awareness Month. 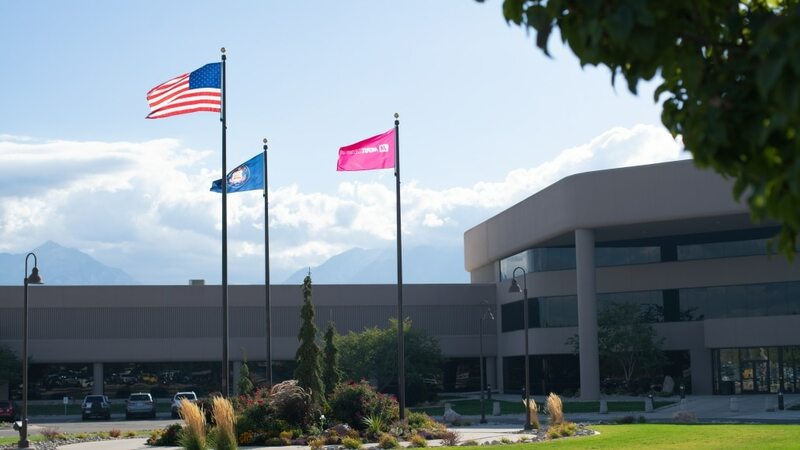 The west perimeter of Merit’s South Jordan Campus is lined with breast cancer awareness flags for the month of October. 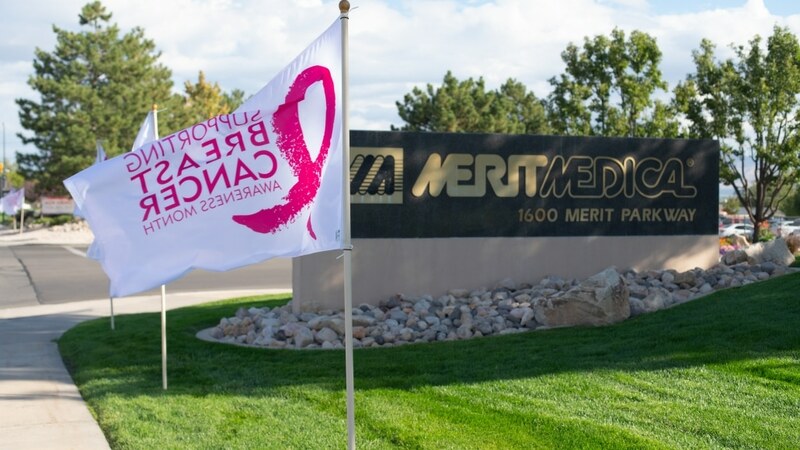 Merit facilities around the globe are flying pink corporate flags, instead of red, for the month of October in support of Breast Cancer Awareness Month. Merit recently made a donation to the Breast Cancer Research Foundation (BCRF), funding 500 critical lifesaving hours of research in the lab. A nonprofit organization committed to achieving prevention and a cure, BCRF funds breast cancer research worldwide and specifically allocates 20% of funding to detection research—a goal closely aligned with Merit’s technologies. 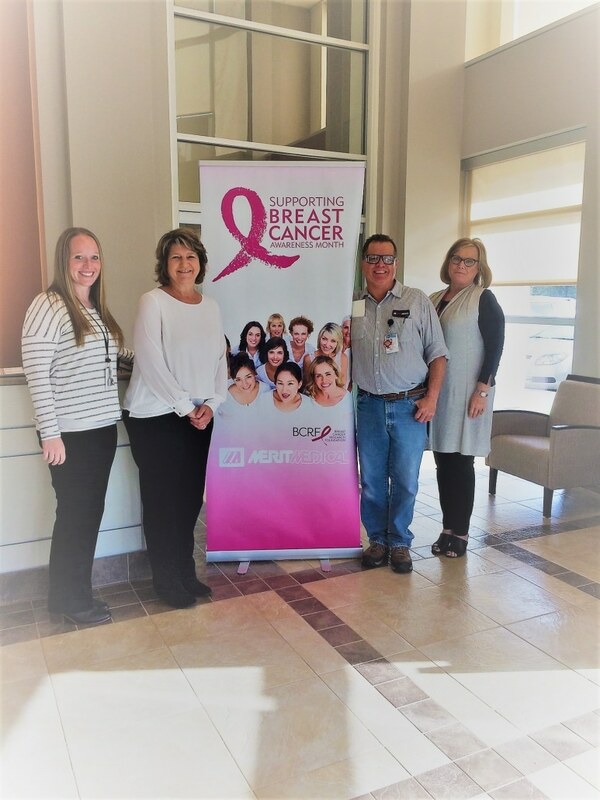 When it comes to fighting breast cancer, Merit Medical is proud to do its part to promote breast cancer awareness and to support women’s healthcare with products and research. For regular updates, visit this page throughout the month of October to see all the ways we’re supporting our friends in pink.